VARNISH AND SLUDGE PACIFIER Varnish and sludge are produced via many oil degradation pathways. Once they get infused into the oil and deposit on machine surfaces, there is no easy solution to eradicate their presence short of an oil change and flush. Additives may help slow the formation of varnish and sludge precursors, but they will do little to pacify damage after they form. GLYCOL NEUTRALISER Ethylene glycol is mixed with water and used as a coolant in a wide range of machines. When allowed to invade a lubricant, it becomes a pungent contaminant that can wreak havoc in numerous ways. Sadly, the thought that there are lubricant additives that will neutralize the effects of glycol contamination is nothing but a fantasy. As much as 10 percent of all diesel engine lubricants in service have trace amounts of glycol contamination. Many are far more grossly contaminated. SOOT TERMINATOR Soot can be dispersed by additives, but it can’t be easily expunged. Even dispersed soot causes wear when oil films become contracted, such as in cam lobe/follower contacts and at the ring reversal area on cylinder walls in diesel engines. Soot can also mop up important polar additives and prematurely remove them from active duty. 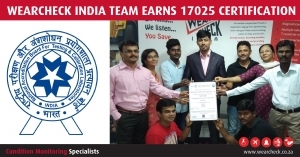 WearCheck’s branch in Chennai, India, recently underwent a stringent annual inspection for their ISO 17025 recertification assessment and passed - with flying colours. An on-site evaluation was conducted by an external quality consultant, who spent two full days checking everything from record maintenance to test capabilities and everything in between. Diagnostician Quinton Verster was invited by Cummins to present the benefits of condition monitoring to a group of matric pupils as part of their recent work experience programme. Specialist engine manufacturers Cummins have been customers of WearCheck for many years. Keeping the engines running smoothly with only planned maintenance and no surprise component failures is a crucial element of Cummins’ quality practice, therefore a good preventive maintenance strategy is key. 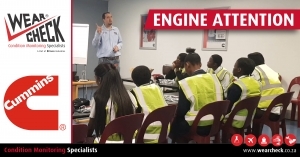 WearCheck diagnostician Quinton Verster outlines the benefits of condition monitoring to a group of Clairwood High School matrics who recently visited engine manufacturers Cummins in Durban recently. Limits vs. Trends – this topic is discussed in detail by our diagnostic manager John Evans in the latest issue of WearCheck’s Monitor newsletter. You will also find news of the customer survey lucky draw winner, and stories on WearCheck’s lab opening times over the festive season, 2019 training course dates and information, insights and pics from all the latest industry expos and customer training sessions, some noteworthy achievements by the company and an introduction to some new WearCheck faces. The children of St Vincent’s orphanage were treated once again by our kind-hearted staff to some Christmas cheer – read all about these stores and more in the latest issue of Monitor. 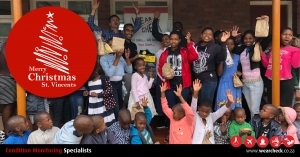 For many years, WearCheck has supported the children of St Vincent’s orphanage in Mariannhill with a range of different CSI projects, and this year was no different. The children were given a delicious snack pack each, and various items were donated, including much-needed school shoes. Money for the project was donated by WearCheck staff members, and the company matched what was collected from the staff. WRONG-OIL FORGIVER Lubricants and their additives do not automatically adjust to the environs and needs of the machines within which they are placed. There are thousands of different lubricant formulations on the market for a reason. They are not alike, and they don’t perform alike and, hence, users will not receive like results. Precision lubrication is about precisely selecting the right lubricant for the target machine and making sure that particular lubricant is always used and then replaced before its life is done. WATER ZAPPER Water exacts an evil curse on lubricants and machines. It accelerates wear, corrosion, microbial growth, friction, additive depletion, aeration, varnish, oxidation . . . and, well, the list goes on and on. Outside of the limited capability of rust inhibitors, additives don’t stop the penetration and damage exerted by water. Only controlling the invasion and dispersion of water in our lubricants solves these problems. OIL STARVATION PAIN-KILLER Despite the assertions of some late-night television infomercials, additives are not a solution for starved oil supply or low oil levels. Lubricants service many functions beyond simply controlling friction and wear. As such, they need to be present as an entire formulation, not simply a few chemical remnants clinging to the frictional surfaces of our machine. 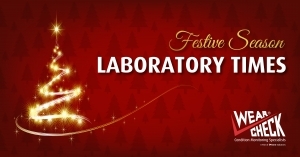 Please note that WearCheck is dedicated to being available all year, therefore some of our laboratories will remain open during the festive season in order to process samples. 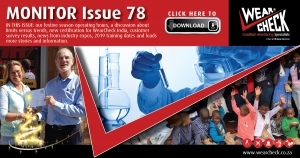 Please note the operating days and times of your nearest laboratory. We are proud to announce that WearCheck was recently rated as a Level 2 BBBEE contributor, placing the company firmly on track as a robust participant in South Africa’s economic development. The BBBEE scorecard system provides a measure of an organisation’s commitment to transformation. 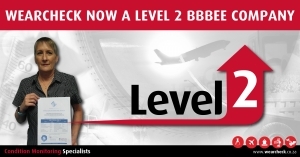 Here, WearCheck sales developer Kay Meyrick proudly displays the company’s new Level 2 BBBEE certificate. I’m afraid I have some bad news . . . and no, it’s not about the economy. It’s about what I often call “imaginary additives”. These are the additives that seem to exist in the minds of many lubrication practitioners but don’t exist in the physical world of lubrication reality. They seem to provide solace to those who pay the bills of machinery unreliability. As good as modern lubricants may be, they are never a panacea for bad lubrication practices. ANTI-DIRT The only remedy for dirty oil is a filter or an oil change. Even better is not having dirty oil in the first place (via routine contaminant exclusion). 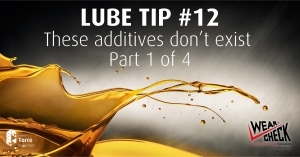 Don’t imagine that there is some virulent, dirt-curing additive in your lubricant’s formulation. Dirt doesn’t care how sophisticated your lubricant’s chemistry might be. Whether your lubricant emerged from a backroom or a space-age laboratory, dirt will spare no effort to cut, abrade, dent and score your machine surfaces.